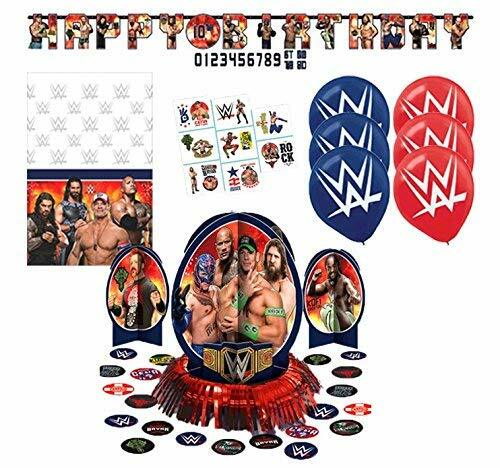 This 47 Piece Licensed WWE® Party Supplies Value Bundle includes a Jumbo paper Banner with customizable age number, 3 centerpiece table decorations, 20 pieces of printed paper confetti, a plastic tablecloth, 6 balloons and a package of 16 temporary tattoos! World Wrestling Entertainment, Inc. is the ultimate platform for professional wrestling! Now it is ready to be your party platform! We've included everything you'll need for the ultimate birthday experience! 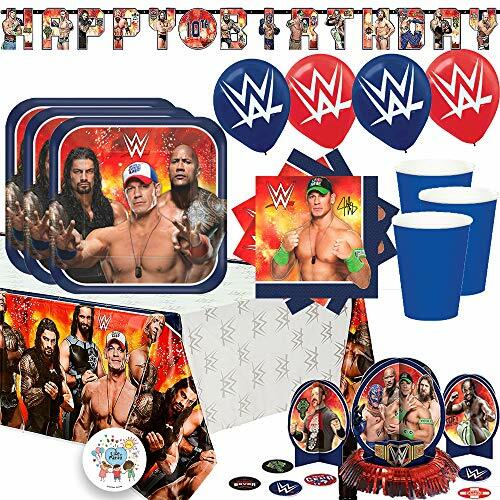 We've included enough for 16 guests with; 16- 9" Square WWE Paper Plates, 16- WWE Small Beverage Napkins, 16- 9oz Blue Cups, 1- 54' x 96" Table cover, 6- Latex WWE Balloons (3 Blue, 3 Red), 1- Add An Age WWE Birthday Banner, 1- WWE Table Decorating Kit (Includes; 1 Foil Fringe Centerpiece, 12 1/2" 2 3-D Paper Centerpieces, 6 1/2" 20 Pieces of Paper Confetti, 2"). Plus an EXCLUSIVE "Life of Party" 2.5" Button which can be used as an activity prize or gifted to a special guest or the host themselves! Enjoy your special WWE event with all of your friends and family! 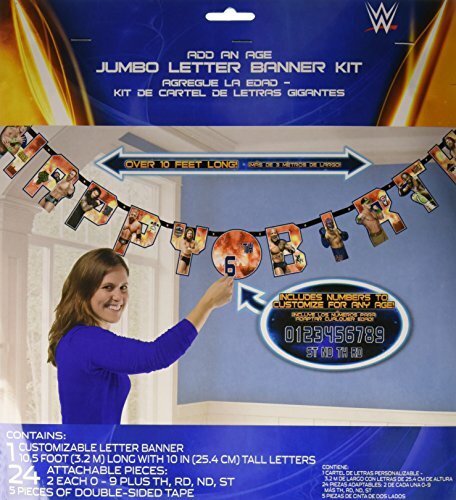 The WWE Plastic Table Cover (Each) is one of the essential items that you need for your party. You can use this product and mix and match it with similar products and colors to create a one-of-a-kind party. No party is complete without a theme and these items will certainly help you make your event special. 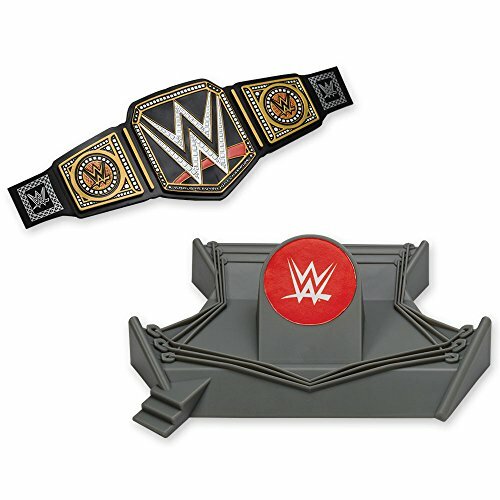 Make your theme party a success when you set your table with the WWE Standard Kit (Serves 8). It comes with plates, cups, napkins and cutlery so you have everything you need for serving cake. It's always good to buy extra so guests can have seconds. 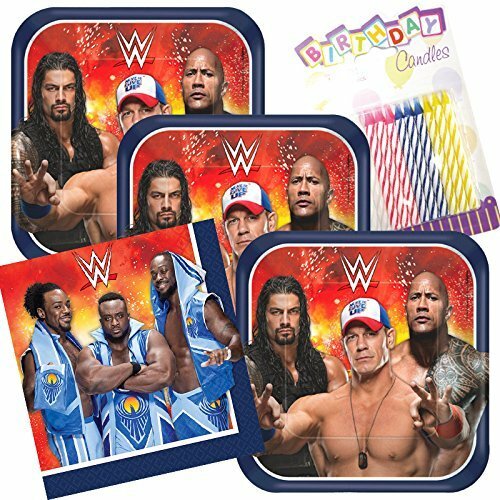 WWE superfans will love these party napkins featuring favorite wrestling stars! 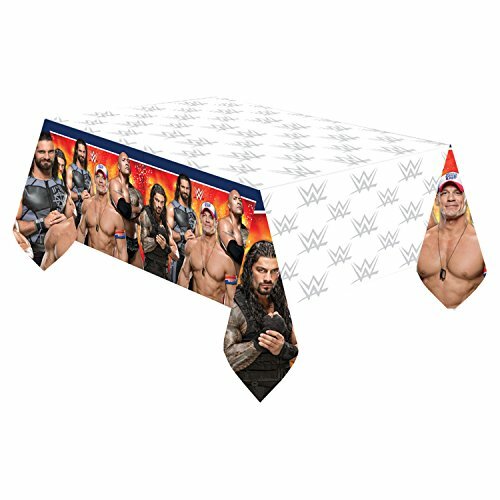 WWE lunch napkins are two-ply and measure 12-7/8 inches by 12-7/8 inches. 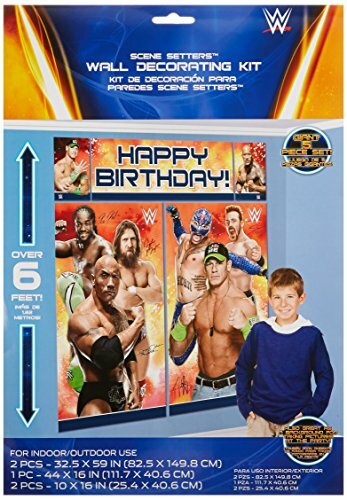 Pair with other WWE party supplies to decorate like a champ! Transform yourself into a WWE superstar. This eight-pack of party masks depict the signature mask of Rey Mysterio. This selection of masks is available in various colors. Give these awesome wrestling masks to your party guests! They'll love them! WWE Foil Balloon Bouquet -WWE Birthday Party Supplies Decoration Favor ~ 5 pc.